Customers are confronted with a variety of different challenges regarding selecting jaw couplings inserts. With four different insert materials to choose from, several details about the application should be supplied to offer the best coupling fit. The amount of existing misalignment is a concern when selecting an insert. Ambient temperature of the area where the coupling will operate is an important part of insert selection. The amount of torque a particular spider can handle is also a very important factor in selecting the insert material. 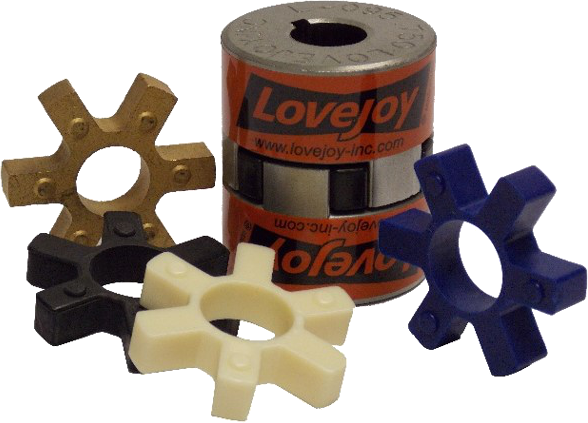 By looking at the different inserts available, Lovejoy can evaluate the advantages and disadvantages of each material and select the best fit for the application. The standard SOX spider or Buna-N material rubber offers the advantage of vibration damping. The Buna-N also has good resistance to oil and greater misalignment capabilities than Hytrel and Bronze inserts. Some of the draw backs to Buna-N are its lack of resistance to certain types of chemicals and having the lowest torque rating of all of the inserts. Urethane provides customers with better chemical resistance than the Buna-N material and 1.5 times the torque capacity of the Buna-N material. However, the Urethane material does not dampen vibration as well as the rubber material. The Hytrel insert has the advantage of carrying the most torque of the elastomers. Hytrel also has excellent resistance to many different chemicals and a temperature rating (250o F) higher than the Buna-N and Urethane inserts. However, due to the hardness of the material, Hytrel only offers about half the misalignment of the rubber insert and does dampen vibration. The Bronze material insert offers the highest temperature rating (450o F) and has good chemical resistance characteristics. Bronze also has a high torque rating similar to the Hytrel material. The main disadvantage of a bronze insert is that it can only be used in applications running at 250 RPM or lower. With all of the these choices available, finding out application’s horsepower, speed, type of machinery to be connected, possible chemical exposure, and ambient temperature of coupling’s environment are critical. By outlining the strengths and weaknesses of each type of spider material, it is clear that one spider does not fit all. If this were true, there would be only one spider material. By considering the application information, the best material choice can be made. The result is the best fit for the application, which results in longer life for the insert. Author Credit: This article was written by Charlie Mudra (National Accounts Manager, Lovejoy, Inc.).